Our eye doctors in Moorestown caters to the needs of our very youngest patients. Our optometrists regularly see children as young as several weeks of age and we are acutely aware of the differences between an eye exam for an adult and a child. We make the examination process FUN!!! The children play “games” with our doctors, and the doctors often spend more time examining the child while playing on the floor or while the child sits on mom or dad’s lap. Moorestown Eye Associates has obtained special pediatric eye care equipment so we are not using grown-up equipment on a non-grown up, and the children usually leave anxious to return next year for their next annual examination. Amblyopia, or lazy eye, is the leading cause of blindness in children in the USA, and it is much more easily treated in the preschool years. That is why early eye examinations–BEFORE the pediatrician and school screenings– are so crucial! In addition, our eye care clinic participates in the InfantSEE program–a public health initiative aimed at having every child in America examined before the age of 1 regardless of income or health insurance. Go to InfantSEE.org to learn more about that program! 80% of learning is visual in the first 10 years of life. 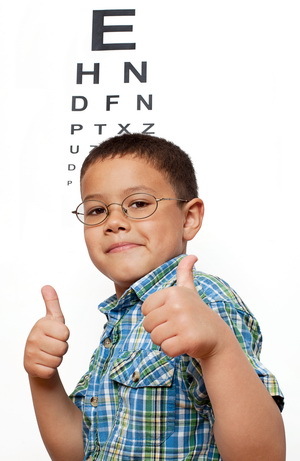 Schedule your child’s eye exam to make sure they have the visual skills necessary for effective learning!